Name Variation John Sadler was also known as Saddler. John Sadler was born circa 1827 at Ohio. He was the son of James Sadler and Nancy (?). [S249] U.S. Federal Census 1850 U.S. Federal Census, by Ancestry.com, Stamp 27. Stamp 53. Dwelling 391. Philip E. Bird was born in December 1840 at Indiana. He married Alice Susan Huff on 11 November 1866 at Pottawattamie, Iowa. Philip E. Bird died in 1911. [S246] U.S. Federal Census 1880 U.S. Federal Census, by Ancestry.com, NA Film Number T9-0361 Page Number 147A. [S245] U.S. Federal Census 1900 U.S. Federal Census, by Ancestry.com, ED120. Dwelling 342. Name Variation Alice Susan Huff was also known as Susan Alice. Married Name 11 November 1866 As of 11 November 1866,her married name was Bird. Alice Susan Huff was born on 24 June 1851 at Springfield, Sangamon, Illinois. She married Philip E. Bird on 11 November 1866 at Pottawattamie, Iowa. Rose Ella Bird was born circa 1868 at Oakland, Pottawattamie, Iowa. She was the daughter of Philip E. Bird and Alice Susan Huff. Kitty A. Bird was born circa 1873 at Oakland, Pottawattamie, Iowa. Orville E. Bird was born circa 1878 at Oakland, Pottawattamie, Iowa. He was the son of Philip E. Bird and Alice Susan Huff. Floyd D. Bird was born in March 1888 at Oakland, Pottawattamie, Iowa. Genevieve Bird was born in November 1892 at Oakland, Pottawattamie, Iowa. Leo E. Brock was born in January 1889 at Iowa. He was the son of William Marion Brock and Clara Myriah Halladay. [S245] U.S. Federal Census 1900 U.S. Federal Census, by Ancestry.com, ED122. Dwelling 208. Hazel Brock was born in September 1893 at Iowa. She was the daughter of William Marion Brock and Clara Myriah Halladay. Jessie W. Brock was born in July 1894 at Iowa. Cecil Brock was born in August 1896 at Iowa. Joe H. Schroeder was born circa 1864 at Wisconsin. He was the son of (?) Schroeder. [S250] U.S. Federal Census 1930 U.S. Federal Census, by Ancestry.com, ED31-38. Stamp 199. Dwelling 307. Name Variation Johannes Kieler was also known as John. Johannes Kieler was born on 29 September 1800 at Struth, Thüringen, Germany. He was the son of Jacob Kieler and Anna Margaretha Vondran. Johannes Kieler married Katharina Hupe in 1825. Johannes Kieler died on 3 May 1882 at age 81. He was buried after 3 May 1882 at Immaculate Conception Church Cemetery, Kieler, Grant, Wisconsin. 1880 Jamestown, Grant, Wisconsin Johannes Kieler was listed as father in Frank Kieler's household on the 1880 Census at Jamestown, Grant, Wisconsin. John and Catherine (HUBE) KIELER, were both also born in Prussia, he in 1800, and she in 1806. There they obtained their education, and there they were married. Mr. KIELER was a stone mason and contractor in his own country. In August, 1855, they came to this country, making the voyage across the ocean in a sailing vessel, and landing at Quebec. They came to Wisconsin by way of the lakes, and settled in Jamestown, Grant county, where he bought a tract of land and made a home near what is now known as Kieler, named after the family. This was the home of this honest and worthy couple as long as they lived. the husband and father died in 1882, and the mother in 1888. Both were devout members of the Catholic Church, and he was instrumental in the establishment of the first Catholic Church built in Kieler in 1856. Johannes Kieler and Katharina Hupe immigrated in August 1855 to via Quebec, Canada, Grant, Wisconsin. 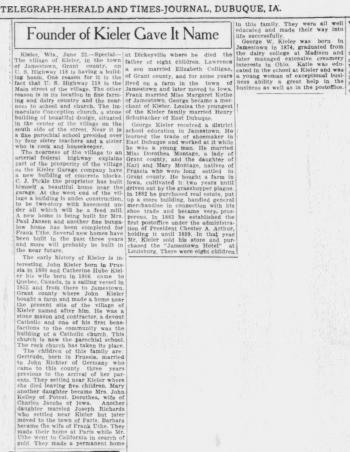 In 1929 Article: Founder of Kieler Gave It Name - John Kieler history. [S248] U.S. Federal Census 1860 U.S. Federal Census, by Ancestry.com, Dwelling 642. [S247] U.S. Federal Census 1870 U.S. Federal Census, by Ancestry.com, Dwelling 7. Name Variation Katharina Hupe was also known as Catherine. Name Variation Katharina Hupe was also known as Anna Maria Catharina. Name Variation Katharina Hupe was also known as Hube. Name Variation Katharina Hupe was also known as Hugo. Married Name 1825 As of 1825,her married name was Kieler. Katharina Hupe was born on 12 February 1805 at Kefferhausen, Eichsfeld, Thüringen, Germany, also reported as 1806. She married Johannes Kieler, son of Jacob Kieler and Anna Margaretha Vondran, in 1825. Katharina Hupe died on 30 May 1888 at Kieler, Grant, Wisconsin, at age 83. She was buried after 30 May 1888 at Immaculate Conception Church Cemetery, Kieler, Grant, Wisconsin. 1880 Jamestown, Grant, Wisconsin Katharina Hupe was listed as mother in Frank Kieler's household on the 1880 Census at Jamestown, Grant, Wisconsin. Katharina Hupe and Johannes Kieler immigrated in August 1855 to via Quebec, Canada, Grant, Wisconsin. In 1929 Article: Founder of Kieler Gave It Name - John Kieler history. Arthur Wiederhold was born on 19 July 1897 at Wisconsin. He was the son of Joseph Wiederhold and Elizabeth Uthe. 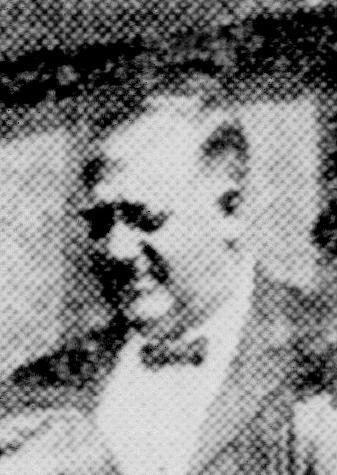 Arthur Wiederhold married Emma M. Speaker after 1918. As of August 1918, Arthur Wiederhold was never married. He was buried in March 1983 at Holy Ghost Cemetery, Dickeyville, Grant, Wisconsin. He died in March 1983 at age 85. On 29 August 1918 at WW II Draft Registration, Grant, Wisconsin. [S245] U.S. Federal Census 1900 U.S. Federal Census, by Ancestry.com, ED47. Dwelling 117. Married Name Her married name was Speaker. Name Variation Lauretta Wiederhold was also known as Loretta. Lauretta Wiederhold married Joseph Speaker. Lauretta Wiederhold was born in May 1900 at Wisconsin. She was the daughter of Joseph Wiederhold and Elizabeth Uthe. Name Variation Lawrence Koethe was also known as Laurence. Lawrence Koethe was born on 8 February 1875 at Wisconsin. He was the son of Henry Koethe and Anna Uthe. Lawrence Koethe was buried in December 1934 at Immaculate Conception Church Cemetery, Kieler, Grant, Wisconsin. 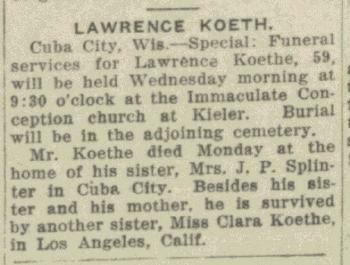 He died in December 1934 at Cuba City, Grant, Wisconsin, at age 59 Lawrence Koeth obituary. On 12 September 1918 at World War I Draft Registration, Grant, Wisconsin. On 2 July 1921 at Kieler, Grant, Wisconsin, George and Dorothea (Montag) Kieler 50th wedding anniversary celebration. [S246] U.S. Federal Census 1880 U.S. Federal Census, by Ancestry.com, NA Film Number T9-1427 Page Number 161D. [S245] U.S. Federal Census 1900 U.S. Federal Census, by Ancestry.com, ED37. Dwelling 15. [S244] U.S. Federal Census 1910 U.S. Federal Census, by Ancestry.com, ED28. Dwelling 121. [S243] U.S. Federal Census 1920 U.S. Federal Census, by Ancestry.com, ED106. Dwelling 169. [S250] U.S. Federal Census 1930 U.S. Federal Census, by Ancestry.com, ED22. Dwelling 34. Name Variation Clara Koethe was also known as Clary. Clara Koethe was born on 28 September 1877 at Kieler, Grant, Wisconsin. She was the daughter of Henry Koethe and Anna Uthe. Clara Koethe died on 6 September 1951 at Santa Ana, California, at age 73 Miss Clara Koethe, 73, obituary. She was buried after 6 September 1951 at Immaculate Conception Church Cemetery, Kieler, Grant, Wisconsin. Married Name 21 May 1894 As of 21 May 1894,her married name was Splinter. Barbara Koethe was born on 16 September 1873 at Kieler, Grant, Wisconsin, also reported as Sep 1872. Barbara Koethe witnessed the burial of Grace Splinter on 6 February 1931 at St Rose Cemetery, Cuba City, Grant, Wisconsin. 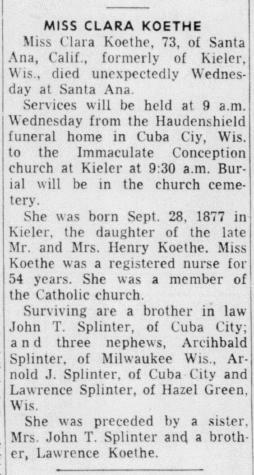 Barbara Koethe was buried in 1939 at Saint Rose of Lima Cemetery, Cuba City, Grant, Wisconsin. 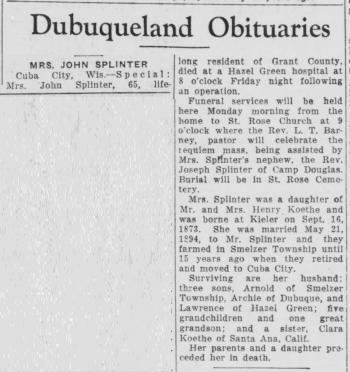 She died in July 1939 at Hazel Green, Grant, Wisconsin, at age 65 Mrs John (Barbara Koethe) Splinter obituary. [S387] Family Search; Multiple Records, "Wisconsin, County Marriages, 1836-1911," database, FamilySearch (https://familysearch.org/ark:/61903/1:1:XRJD-CMJ : 3 June 2016), Anna Uthe in entry for John Thedore Splinter and Barbara Koethe, 22 May 1894; citing , Grant, Wisconsin, United States, Wisconsin Historical Society, Madison; FHL microfilm 1,266,663. Martin Schumacher married Theresa (?). Martin Schumacher was born on 21 October 1819 at Baden, Germany. He died on 22 August 1900 at Cattaraugus, New York, at age 80. Martin Schumacher and Henry Schumacher immigrated circa 1851. Theresa (?) married Martin Schumacher. Theresa (?) was born on 21 March 1822 at Baden, Germany. She died on 1 December 1896 at Cattaraugus, New York, at age 74. Theresa (?) immigrated with Henry Schumacher and Martin Schumacher circa 1851. Name Variation Henry Schumacher was also known as Heinrich. Henry Schumacher was born on 16 December 1844 at Baden, Germany. He was the son of Martin Schumacher and Theresa (?). Henry Schumacher married Louise Kieler, daughter of Johannes Kieler and Katharina Hupe, on 29 April 1869. Henry Schumacher died on 12 August 1915 at East Dubuque, Jo Daviess, Illinois, at age 70 Henry Schumacher obituary. He was buried after 12 August 1915 at East Dubuque Cemetery, East Dubuque, Jo Daviess, Illinois. Henry Schumacher and Martin Schumacher immigrated circa 1851. [S246] U.S. Federal Census 1880 U.S. Federal Census, by Ancestry.com, Year: 1880; Census Place: East Dubuque, Jo Daviess, Illinois; Roll: 216; Family History Film: 1254216; Page: 213D; Enumeration District: 051. [S245] U.S. Federal Census 1900 U.S. Federal Census, by Ancestry.com, Year: 1900; Census Place: Dunleith, Jo Daviess, Illinois; Roll: 310; Page: 5B; Enumeration District: 0032; FHL microfilm: 1240310. Name Variation Louise Kieler was also known as Louisa. Married Name 29 April 1869 As of 29 April 1869,her married name was Schumacher. Louise Kieler was born on 25 January 1848 at Mühlhausen, Saxony, Prussia, also reported as 25 Jan 1847. She was the daughter of Johannes Kieler and Katharina Hupe. She married Henry Schumacher, son of Martin Schumacher and Theresa (? ), on 29 April 1869. Louise Kieler died on 29 January 1938 at East Dubuque, Jo Daviess, Illinois, at age 90 Louise (Kieler) Schumacher obituary. She was buried on 29 January 1938 at East Dubuque Cemetery, East Dubuque, Jo Daviess, Illinois. Louise Kieler immigrated with Johannes Kieler and Katharina Hupe in August 1855 at via Quebec, Canada, Grant, Wisconsin. Louise Kieler had 7 with 4 living in 1900 children. In 1929 Article: Founder of Kieler Gave It Name - John Kieler history. Married Name August 1897 As of August 1897,her married name was Schumacher. Catherine Fuerstenberg was born in 1866. She was the daughter of Christopher Fuerstenberg. Catherine Fuerstenberg married George M. Schumacher, son of Martin Schumacher and Theresa (? ), in August 1897. Catherine Fuerstenberg died after 1925. Married Name 10 March 1921 As of 10 March 1921,her married name was Biver. Loretta B. Hauser was born on 8 November 1901 at Wisconsin. She was the daughter of Martin F. Hauser and Katherine Uthe. Loretta B. Hauser married Ralph J. Biver on 10 March 1921 at Dubuque, Iowa. Loretta B. Hauser died on 31 August 1942 at age 40 Loretta B (Hauser) Biver obituary. She was buried in September 1942 at Mount Calvary Cemetery, Dubuque, Dubuque, Iowa. 1 January 1925 Dubuque, Dubuque, Iowa Loretta B. Hauser appeared on the census of 1 January 1925 in the household of Ralph J. Biver at Dubuque, Dubuque, Iowa. [S244] U.S. Federal Census 1910 U.S. Federal Census, by Ancestry.com, ED132. Dwelling 46. Leona E. Hauser was born on 12 September 1903 at Wisconsin. Leona E. Hauser was buried in September 1984 at Mount Calvary Cemetery, Dubuque, Dubuque, Iowa. She died in September 1984. [S250] U.S. Federal Census 1930 U.S. Federal Census, by Ancestry.com, ED36. Dwelling 36. Walter A. Hauser married Wanda S. Brown. Walter A. Hauser was born in 1905 at Iowa. He was the son of Martin F. Hauser and Katherine Uthe. 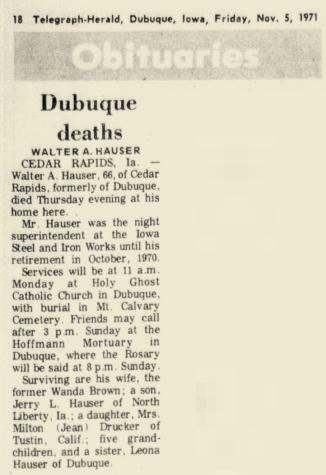 Walter A. Hauser was buried in 1971 at Mount Calvary Cemetery, Dubuque, Dubuque, Iowa. He died in 1971 Walter Hauser obituary. Name Variation Francis Xavier J. Brant was also known as Frank. Name Variation Francis Xavier J. Brant was also known as Brandt. Francis Xavier J. Brant married Margaret Tacke. Francis Xavier J. Brant was born on 2 February 1877 at Jamestown, Grant, Wisconsin. He was the son of Joseph Brandt and Dora Haas. 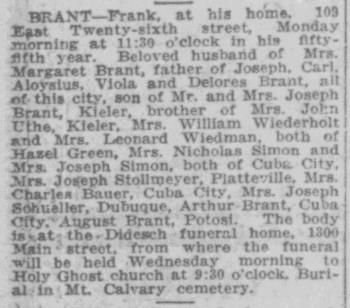 Francis Xavier J. Brant died on 2 May 1932 at at home, Grant, Wisconsin, at age 55 Frank Brant obituary. In September 1925 at Kieler, Grant, Wisconsin, Joseph and Dora (Haas) Brant celebrate 50th wedding anniversary. [S246] U.S. Federal Census 1880 U.S. Federal Census, by Ancestry.com, NA Film Number T9-1427 Page Number 165A.